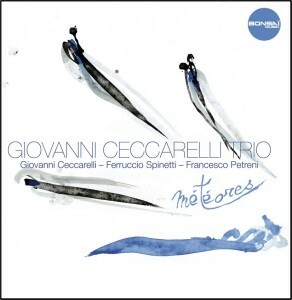 Giovanni Ceccarelli – piano, Fender Rhodes piano; Ferruccio Spinetti – double bass; Francesco Petreni – drums. Special guests: David Linx – vocals; Fausto Mesolella – vocals, guitars. Giovanni Ceccarelli is featured also as composer and arranger. Production and release in France: Bonsaï Music – distr. Harmonia Mundi, 2011. Special edition and release in Japan: Production Dessinée, 2011. Release in Italy: Egea, 2011. Awarded “Sélection FIP” for June 2011 by French national radio FIP, “Sélection HMCH” in 2011 by Harmonia Mundi Switzerland, “Sélection écouteurs” in 2013 by French radio program “Birdland” – Radio Alpa. This record was released in Italy (distribution by Egea) and Japan (special edition and distribution by Production Dessinée). Marco Crisostomi, review of CD “Météores”, Italian magazine “Audio Review”, 2012.